What part does geothermal energy play in satisfying energy demands? This informational piece, part of a series about the future of energy, introduces students to heat within the Earth as an energy source. 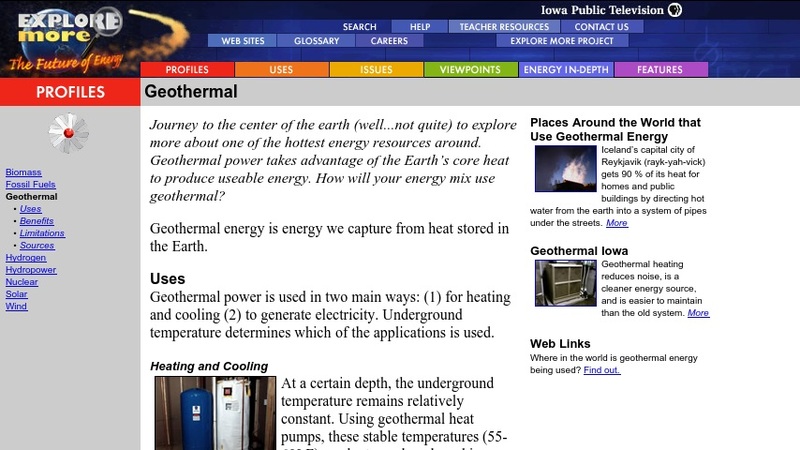 Here students read about the uses, benefits, and limitations of geothermal energy. Articles and information on places around the world that use geothermal energy and geothermal use by schools in Iowa are available from a sidebar. A link to a map of geothermal hotspots around the world is provided, along with a link to an ABC News article about geothermal power.